Yes, we have a new little addition to the STAMPlorations team to celebrate! Congrats to Deepti and Vikas on the arrival of their son, Siddharth! And what better way to celebrate than with a blog hop. Check out all the details right here. The background of my card has been made with the Oh My Stars! ARTplorations stencil. I’ve used a stencil monoprint technique and then stamped some stars from Deepti’s Balloons and Banners set. The balloons and hearts are from the same set. There’s some white Wink of Stella on the balloons. I’ve also paper pieced a coffee cup from Sketchy Coffee Cups and grounded it with a stamp from the Mixed Media Elements set. The sentiment is computer generated. The linky will be open for two weeks so you can join in the fun. Again, big congrats, Deepti! Can’t wait to see a picture of your sweet little one! 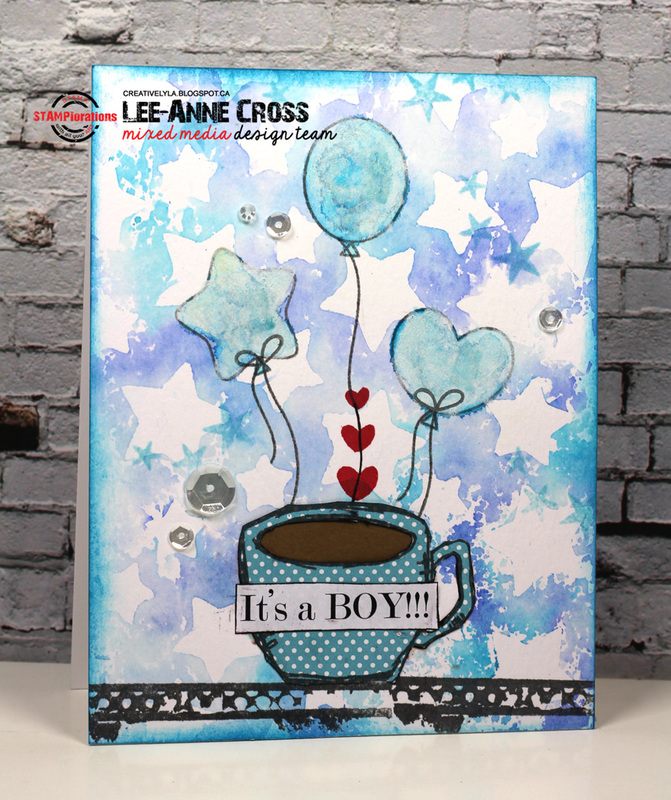 Great artsy card, Lee Ann! Fabulous card, Lee-Anne! I love how you've placed the little hearts. Gorgeous card, I love the paper piecing and the stunning background!